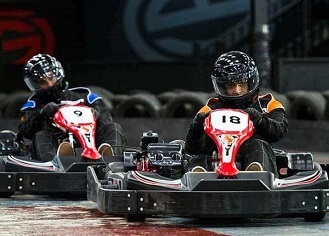 Situated within easy reach of all the Stag Party hotspots Top Gear Karting is the ideal choice for an indoor kart event. The venue caters for drivers as young as 8 years old and also provides a full range of individual and team events as well as practice sessions for those looking to gain an advantage or simply improve their karting skills. Children's Parties of 8 or more by pre booking only, 25 Lap Karting Session. 10 minutes practice/qualifying and a 100 lap race. A 90-minute team endurance event. Qualifying to determine your grid position then a non-stop 90-minute relay event for teams of 2 to 4 drivers sharing a kart. The venue has vending machines only.